Do you like to stay up to date with the latest baby trends? Each year, trends change and it’s not always easy to keep up with them; especially if you’ve just become a first-time parent. 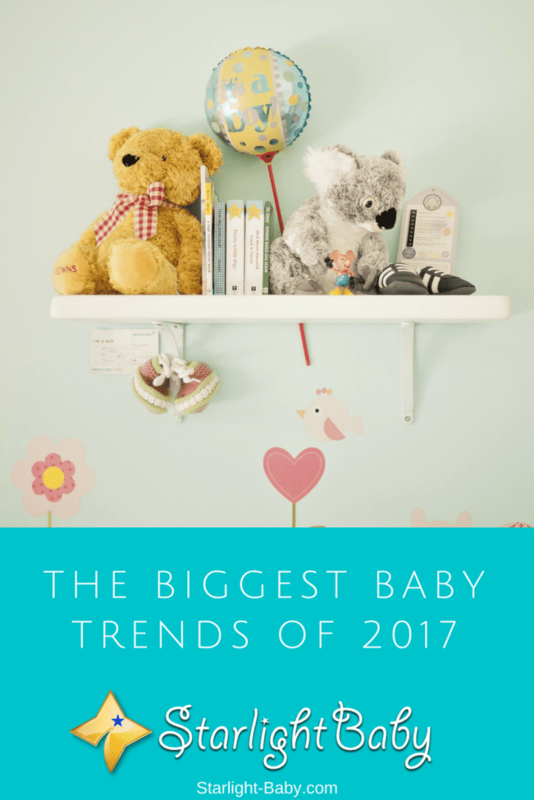 Whether you’re looking for the latest baby name trends, trends in baby products or you’re wondering what color to paint the nursery, here we’ll look at the biggest baby trends of 2017. Let’s start with the top baby names of 2017. If you’re expecting your little bundle of joy soon but you don’t have a name yet, you’ll find plenty of inspiration here. Or maybe you’re just interested to know what names are currently in? This year, parents are set to venture away from traditional names to more unique, adventurous alternatives. Many parents are looking at more unusual sources for inspiration such as gods, childhood heroes and wild animals. According to experts, 2017 is set to be a revolutionary year for baby naming. Obviously not all parents are going to choose these more unique names. One of the more traditional trends set to feature predominantly this year is names starting with “O”. So, that includes names such as Owen, Oliver, Oscar, Olivia, Ophelia and Octavia. So, as you can see, 2017 is the year when a lot of new names are becoming popular. Whatever unique name you can come up with, whether it be taken from a river, wild animal, planet, or god, you can be sure you’re sticking to the 2017 naming trend! Big Floral Themes – Floral themes dominated throughout 2016, but this year they’re set to become even bigger, literally! Large, three dimensional floral decorations are set to really take over. Glam Bo-Ho Style Wall Hangings – Again, Bo-Ho was big in 2016, but this year it’s getting a glamorous makeover. In particular, textured, woven wall hangings are set to become a prominent feature in 2017 nurseries. These include wall hangings made from feathers, braids, and macramé. Sweet Décor – One of the more unique trends to look out for this year is the use of candy and confectionaries in nurseries. Ice cream cones, sprinkles and even donuts are all set to make an appearance. Adventure/Outdoor Themes – Mountains and dramatic landscapes are a big hit with modern day nurseries. In 2017, the more dramatic the mountains the better. This is an especially great idea for those seeking a more gender-neutral design. Get creative and you’ll find lots of natural nursery ideas that will fit your style! Cactus – Similar to the adventure theme, there’s been an interesting rise in the number of parents choosing a cactus theme for their little one’s nursery. Cartoon style cactuses work just as well as realistic ones here too. The Adult Nursery – The last trend we’ll look at is becoming really popular and that’s the nursery that doesn’t actually look like a nursery design. Adult, modern designs are taking over, adding a more sophisticated and chic design. It’s easy to mistake these nurseries for a living room. As you can see, whatever your preferences, there’s bound to be a nursery trend to suit you this year. Other themes worth a mention include bunnies, greenery and watercolor accents. We’ve looked at the top 2017 baby names and nursery ideas, but what else should you watch out for? Below we’ll look at some of the other big baby trends making waves this year. Adults have been able to track their sleep patterns for years. However, did you know you can do it for baby too? If you’ve got a tablet or smartphone, you can download various apps which can help you monitor just how much sleep your little one is getting. You can see how often they are sleeping, as well as how deeply they sleep. This then allows you to see whether any changes need to be made. We’ve written an article on infant sleep tracking here that’s worth a read! It’s unsurprising ecofriendly baby products have made it onto the list. As more of us become increasingly worried about our impact on the environment, we constantly look to new ways to lower our carbon footprint. However, ecofriendly baby products have more than just environmental benefits – they’re also great for baby too! From clothing to shampoos, ecofriendly baby products are going to be big this year! Smart wristbands have been around for a while, but recently there’s been a surge in specialist parenting models released. Helping parents to stay well organized, as well as encourage a healthy lifestyle, these wristbands are convenient, clever, and extremely useful. Yes, you read that right – baby hammocks are really taking off this year. Not only do they look cool, but they provide baby with a safe and natural place to sleep. In particular, the suspended varieties are proving especially popular. Overall, there’s a lot of baby trends to watch out for in 2017, but above is a roundup of some of the biggest. You can choose to follow one or all of these trends if you desire, or why not be adventurous and create your own trend? This is a very interesting article. My baby was born in May. When my baby was born, I was not aware of any of these baby trends. Now that I have read this article, I will love to try some of these ideas. For example, I want to build a nursery for my baby with a cactus theme, I also want to get a hammock for my baby. These baby names looks pretty good and appealing to me, maybe I would scoupe one for my baby niece that is on the way (LOL). And coming to the infant sleeping tracking, it’s the best trend in baby section of human existence and experience that I find most interesting because it helps the parent not be a complete slave to the as a result of not knowing some of the pattern of behavior of the child. This is definitely the bomb real deal of baby’s trend in 2017. We are almost at the finishing line of 2017 and I must confess that this year has been a wonderful and an exciting one with lots of trends that we witnessed in both babies, families and parenting roles. The names that we have flowing around are all intriguing, personally I love Thor and Thea most. I have actually named my niece Thea and I’m loving calling her by that name all day long.